Discussion in 'iPhone' started by PhilipNY, Jan 23, 2012.
said "Unable to Purchase: 'Flashlight' could not be purchased at this time. please try again later." After this dialogue disappears, the new app downloading procedure just starts, and seems everything is fine. however, this is very annoying. Delete the app sign out of the store then sign in and repurchase. It'll be free. I have no Idea what "The Lions Roar" is!? 2 others? all my apps download fine. I'm getting this too with some free language apps. I deleted them. Now I keep getting that message. I've been getting that error also. I'm jail broken, how about you guys? Getting similar error occasionally on iPad 2, not jailbroken. I've deleted the app in question, and no errors so far. Have not tried reinstalling the app. Anyhow, it has stopped now. What I did (which I think fixed it) was restore my iPhone from my latest backup (taken before restore began). Happened to me also...but i didn't do anything....and it stopped by itself. 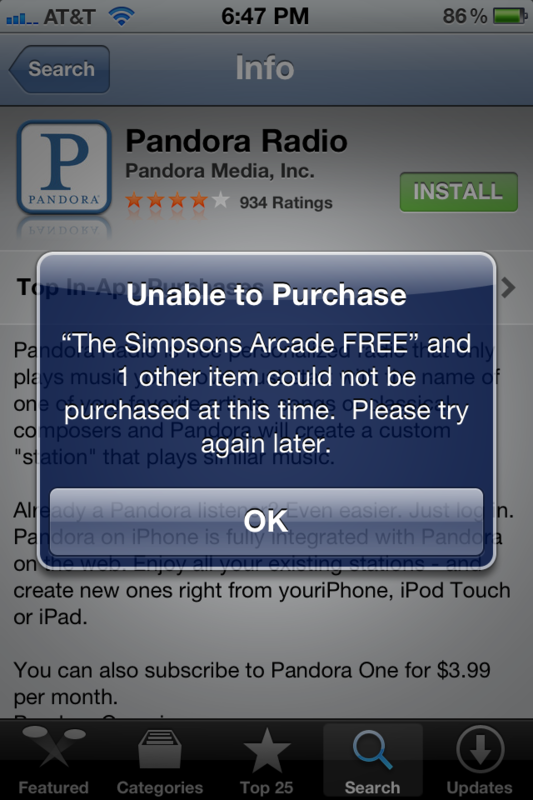 That was two days ago...also app store was very sluggish. Today it is fine. Still happening here. App isn't installed. I deleted it. It's obvious I dont want it. Oh well. Sure it'll get fixed at some point. Its not happening anymore after I set my itunes to sync my apps. Something I haven't done in ages so it put a load of crap back on the phone which I just removed and cleaned up. Yeah, Was a bit of a bummer but it was to annoying to not bother doing it. "Lions Roar" that pops up isn't even an app in the appstore???? ahh ok. Think i'm going to go through all my purchases to get ri do f this blooming thing! Well I went to the iBook app on my phone and 3 things disapeared which must have been removed when synced. I tried to download another app and the message didn't come up. *touch wood* it should be ok. Still have no idea what that book it. Never even seen it and I'm the only one who uses my ID. Any way, Synced the phone before I restored. Everything ok. Went to restore and a message came up with something along the lines of "5 apps (or something like that) have not been synced. If you restore now these items will be removed from your phone" Yes ****ing please! Now that I have restored the message has vanished. Fingers crossed that fixed it. I'm getting - hello German and 6 other apps can't be installed at this time. Duh I removed them that's why! Agh!!! Unfortunately this will haunt you until you restore.